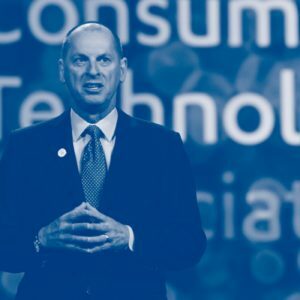 Gary Shapiro is the author of Ninja Future: Secrets to Success in the New World of Innovation and president and CEO of the Consumer Technology Association (CTA), the U.S. trade association representing more than 2,200 consumer technology companies and which owns and produces CES – The Global Stage for innovation. He also helps direct policymakers and business leaders on the importance of innovation in the U.S. economy. Brian Ardinger, Inside Outside Innovation Founder, talks with Gary about innovation, creativity and how to thrive in a changing marketplace. Gary initially worked as a consultant to CES, then was hired to lead the organization. He soon discovered that the CES board was committed to allowing anyone with an idea get exposure. This action spoke to him. Years prior, Gary was involved in a lawsuit over the VCR. He coordinated and spoke on the issue, and now sees the parallels in the video, audio, and sharing industry. Today Gary continues to fight for innovators and breakthrough technology. With the pace of change accelerating, Gary sees the future in areas such as robotics, AI, self-driving cars, drones, medical, dealing with pain, etc. He’s optimistic about the future. Today, the path to corporate success is showing a broad set of skills in a variety of industries and being able to put different things together. Gary is concerned with China’s move on AI and their urbanization leading to an increase in creativity. CES Asia has been happening for five years now with a growing level of innovation. Gary’s book, Ninja Future, is for people who want to understand what’s going on today and what we should expect in the future. Big companies used to have an advantage; however, they are slow to change. Startups have to adapt to survive in a rapidly changing marketplace. If you act like a ninja, you have to have flexibility to move and change quickly. Get a team that’s not like you. Ninjas are people who recognize that change is afoot. The book also includes life hacks and ideas, a tech overview, and things in Gary’s life that made a difference. For more information or to connect with Gary see https://www.cta.tech. CES is held each January in Las Vegas. You can also check out Gary’s previous best-sellers, “Ninja Innovation: The Ten Killer Strategies of the World’s Most Successful Businesses” (HarperCollins, 2013) and “The Comeback: How Innovation will Restore the American Dream” (Beaufort, 2011). If you enjoyed this podcast, you might also enjoy: Ep. 124 – Amy Radin, Author of The Change Maker’s Playbook & FinTech Guru, Ep. 121 – Herman Miller’s Melissa Steach on Design Innovation, and Ep. 102 – Sunayna Tuteja with TD Ameritrade on FinTech Innovation.